An ‘Organizational chart’ (Org chart) is a typical way of representing organizational structures of a company or organization. The free modeling tool ARIS Express supports the modeling of Org charts with its model type ‘Organizational chart’. With the relevant ARIS symbols (organizational unit, role, and person), relationships between individual units like employees or departments are illustrated. The most common organizational chart constructs are similar to a family tree. ARIS Express provides three fragments, thus enabling you to have an easy start to the world of organizational chart modeling. Who is responsible for whom? Who is superior or inferior? An organizational chart represents important roles of the organization, visible for all and clearly arranged. The management and the employees use the chart as a reference for internal and external communication. 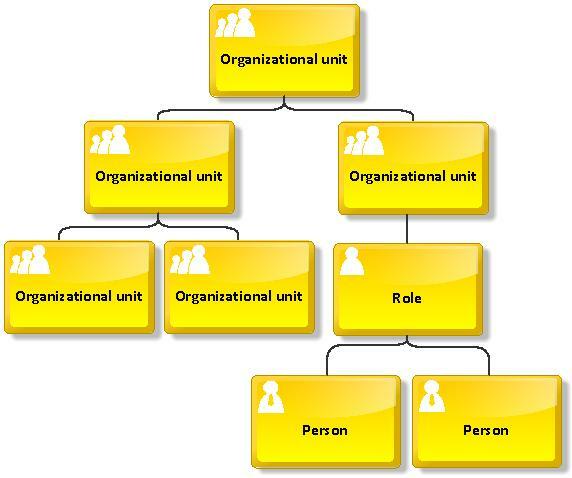 Organizational unit: Unit in an organizational hierarchy, e.g., department or location. It can be used to show which organizational units are superior to others and it can be assigned to roles and persons. Role: Defines tasks, properties, and privileges of a person. It is independent of a specific person. A role can be assigned to multiple persons. Person: Specific person who assumes a role and can be assigned to an organizational unit. A person usually represents an existing employee within the organization. Location: A Location can be a factory, a building, or also an office or an individual workstation in a room. Location refers to a physical place. 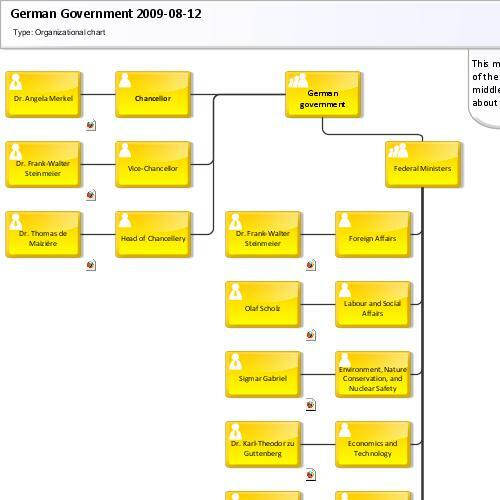 The following example shows an organizational chart of the German government as of August 2009. You can directly browse the org chart below using the interactive model viewer. You can download it and edit it for free in ARIS Express. You can also use the video tutorials provided to find an easy way into the world of ARIS. Let's start modeling Organizational charts!